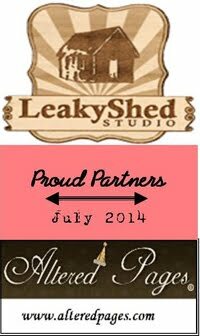 Leaky Shed Studio: Santa's helper, Naughty or Nice? Hi there all my scrappy friends, Maggi here to share this blast from my past with you as I thought it appropriate for the fast approaching holiday season. Yep, I was one of Santa's helpers and I thought this photo was perfect to pair with our Julie Nuttig Naughty or Nice 4' chipboard doll and our oval Victorian frame. I've painted her skin with watercolors and her hair and boots with markers. My favorite thing to use on chipboard is embossing powder and I keep finding different ways to apply the powder. On this one, I squirted a litle bit of Distress embossing ink out and used a small paintbrush to paint the ink on her dress. That way I was able to avoid getting ink in the cracks that define her pretty skirt. The I sprinkled with Ranger Embossing Antiquities in chinese red. I used a straight pin to clean out any stray powder in the lines and heat embossed. I love the effect of the enamel on her dress and hat. For the fur trim on her hat and dress, I dabbed on Aileene's Glitter Snow with a stiff paintbrush. I also used the largest Leaky Shed's Victorian frame around my photo. I heat embossed the frame with Stampendous aged gold embossing enamel. It gives the frame such a pretty antiqued look. Thanks for stopping by the blog. Please stop by often for more tips on altering your chippies. Wow wow wow!! This is just gorgeous!!!! So much goodness to see!!!!! Thank you Julie for you very kind comments! So gorgeous Maggi! so many beautiful details and love what you did with the Nutting doll!